The bizarre saga surrounding what officials have alleged was an attack on U.S. diplomatic staff in Cuba using a “covert sonic device” has continued to get weirder, with the first comprehensive medical study of the affected personnel revealing that they indeed suffered symptoms resembling the effects of traumatic brain injuries that doctors simply cannot explain. The sounds were often associated with pressurelike (n = 9, 43%) or vibratory (n = 3, 14%) sensory stimuli, which were also experienced by 2 of the 3 patients who did not hear a sound. The sensory stimuli were likened to air “baffling” inside a moving car with the windows partially rolled down. According to the report, the personnel reported feeling the sensations coming from a specific direction, though it is practically impossible at this time to determine the dose and duration of the exposure “because of the limitations of patient recall” and conflicting accounts. All but one of the persons in the study “reported immediate onset of neurological symptoms” when exposed to the mysterious stimuli, with persistent (over three months) symptoms noted in a majority of the personnel. They included cognitive, balance, visual, and auditory dysfunction, sleep impairment, and headaches (sometimes so severe they required treatment). Some staff required hearing aids, though it’s unclear whether that could be the result of normal ageing. Perhaps most puzzling, fellow study author Dr. Douglas Smith told CNN they did not believe the mysterious sounds were actually responsible for the symptoms but that “the audible sound was a consequence of the exposure.” In the accompanying report, Smith mentioned that brain damage can indeed be caused by “ ultrasound, infrasound, and microwaves”—though as Gizmodo previously reported and the authors noted, it would be practically impossible to inflict this kind of damage using ultrasonic or infrasonic methods covertly. What’s more, MRI neuroimaging returned no immediately relevant results. In the second report, experts were noncommittal to the idea the staff were exposed to chemicals or pathogens, citing a lack of evidence. They were similarly noncommittal to widespread hypotheses the staff fell victim to mass psychogenic illness—a term for the poorly understood phenomenon sometimes called “mass hysteria or epidemic hysteria”—as some of the individuals had no idea others were exhibiting symptoms. In other words, the doctors have no idea what the hell is going on, though all of the participants reported improvement in symptoms since leaving Cuba and further neurological testing is planned. 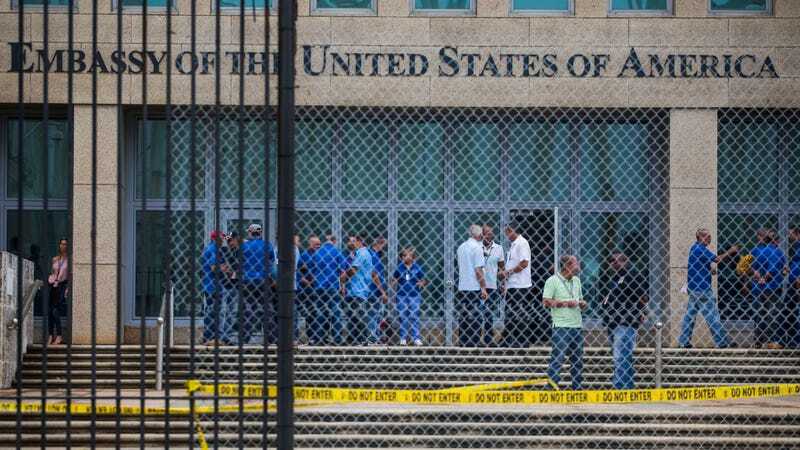 As CNN noted, the Cuban government strenuously denies any involvement in the attacks, but some members of the Senate Foreign Relations committee including Sens. Marco Rubio and Bob Menendez are questioning whether that’s credible. Rubio in particular told CNN that the idea anyone could conduct such an attack in Havana without attracting the attention of Cuban security and intelligence agencies was “outside the realm of reasonable”—though for months, Rubio has been far quicker to identify possible perpetrators than doctors have been able to identify what actually may have happened, and recent improvements in U.S.-Cuban relations have rapidly crumbled.